Alpha Phi Sorority chrome auto emblem (3" x 1.4") by Elektroplate. OEM process (ABS plastic core with a true chrome-plated metal finish) Shiny chrome finish guaranteed to last lifetime of vehicle! NOT a cheap plastic hot-stamp imitation. Attaches via a paint-safe 3M adhesive foam tape. All Elektroplate car emblems are comprised of a chrome-plated metal finish made to withstand harsh outdoor conditions. 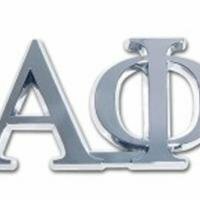 Your Alpha Phi Sorority chrome auto emblem will look brand new for years to come (as opposed to cheap imitations in which will fade or chip within months of being on your vehicle). Our high-end auto emblems are the perfect way to showcase your Sorority pride everywhere you drive, a true upgrade from decals and bumper stickers. In addition all Elektroplate chrome emblems are packaged in elegant retail packaging to make a great gift or stocking stuffer. OEM process (ABS plastic core with a true chrome-plated metal finish); Overall size 3.5" x 1.4"
Made in the USA! Guaranteed to withstand harsh outdoor conditions - won't fade or bleed like cheap imitations. Attaches via 3M paint-safe adhesive foam tape (won't be affected by extreme weather or car washes); Can adhere to any smooth metal, plastic or glass surface.